Send your listings to Ticket!, The News-Sentinel, PO Box 102, Fort Wayne, IN 46801, or email nsfeatures@news-sentinel.com. Include event’s time, date, location, admission cost, reservation deadline and address, or phone number for making reservations. We need information one week in advance. Questions? Call 461-8437. • ALLEN COUNTY PUBLIC LIBRARY: 900 Library Plaza. “The Art of Janak Narayan,” through April 15 in the Jeffrey R. Krull Gallery. Hours: 9 a.m.-9 p.m. Mondays-Thursdays, 9 a.m.-6 p.m. Fridays and Saturdays, and noon-5 p.m. Sundays. Free admission. • ARTLINK: Auer Center for Arts and Culture, 300 E. Main St. “38th Annual National Print Exhibition,” through May 11. Hours: noon-7 p.m. Tuesday-Saturday and noon-4 p.m. Sunday. “Letterpress Workshop,” 10 a.m.-noon Sunday. “Pressing on Screening,” 2-4 p.m. Sunday. “Drawn Together,” gather to draw, sketch, doodle and design, 7-9 p.m. May 2, Calhoun Street Soups, Salads and Spirits, 1915 S. Calhoun St.
• CASTLE GALLERY: 1202 W. Wayne St., “Spring Show,” through May 5. Hours: 11 a.m.-6 p.m. Tuesday-Saturday or by appointment, 426-6568. For more information, visit www.castlegallery.com. • FORT WAYNE FINE ARTS FESTIVAL, call for entries for event planned Sept. 8-9 at Jefferson Pointe mall. Application deadline is May 16. To be considered for this event, artists must submit a completed application form, images of their work and a $25 non-refundable jury fee. Applications and guidelines are available at: www.JeffersonShopping.com, the Jefferson Pointe Mall Office, or by email request at Ten21Creatives@gmail.com. • FORT WAYNE MUSEUM OF ART: 311 E. Main St.: “Steven Sorman: Is Was Will Be,” paintings and prints, through May 27. “David Shapiro: Mantras,” now through May 27. Hours: 10 a.m.-6 p.m. Tuesday-Saturday; 10 a.m.-8 p.m. Thursday and noon-5 p.m. Sunday. • LUPKE GALLERY, University of Saint Francis North Campus, 2702 Spring St.: “Sensing Beauty: A Multi-Sensory Art Experience” features photographs inspired by asking people with a visual impairment, “What does beauty mean to you?” The exhibit also includes a 3-D photography image designed to be touched by people with visual impairment, scents related to photos, Braille descriptions of photos and new audio technology to make the exhibit accessible to more people. Hours: 9 a.m.-5 p.m. weekdays. Free and open to the public. • THE ORCHARD GALLERY OF FINE ART: 6312-A Covington Road, “Clay Figures by Kimberly Rorick and Mixed Media by Hannah Burnworth, through April 30. Hours: 10 a.m.-5 p.m. Mondays, Wednesdays, Fridays and Saturdays, and 10 a.m.-7 p.m. Tuesdays and Thursdays. Free admission. Information: 1-260-436-0927 or www.theorchardgallery.com. 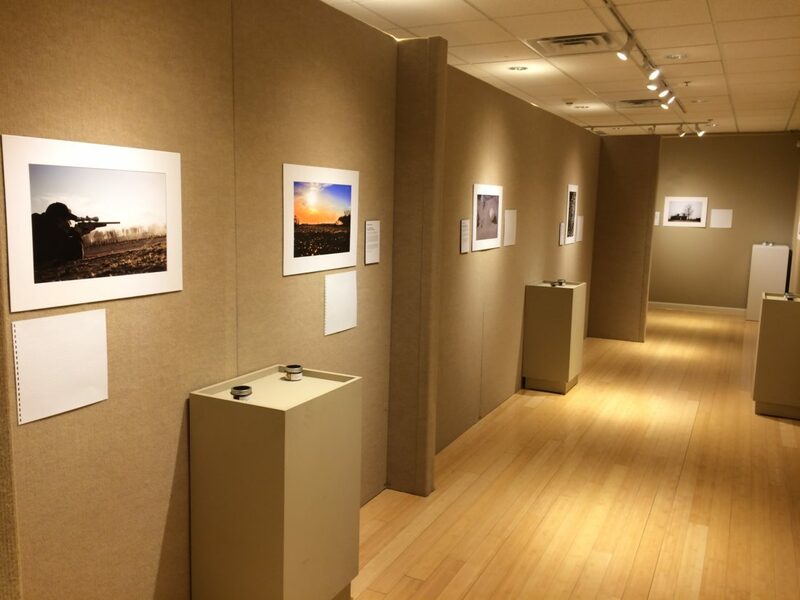 • WEATHERHEAD GALLERY, at the Mimi and Ian Rolland Art and Visual Communication Center on Leesburg Road at the University of Saint Francis, “School of Creative Arts (SOCA) Student Exhibition, featuring art, dance, music and performance-based works by SOCA students, through May 2. Regular hours: 9 a.m.-5 p.m. weekdays, 10 a.m.-5 p.m. Saturdays and 1-5 p.m. Sundays. Free admission.